NEW CGIs show how The Majestic will look following its multi-million pound restoration. 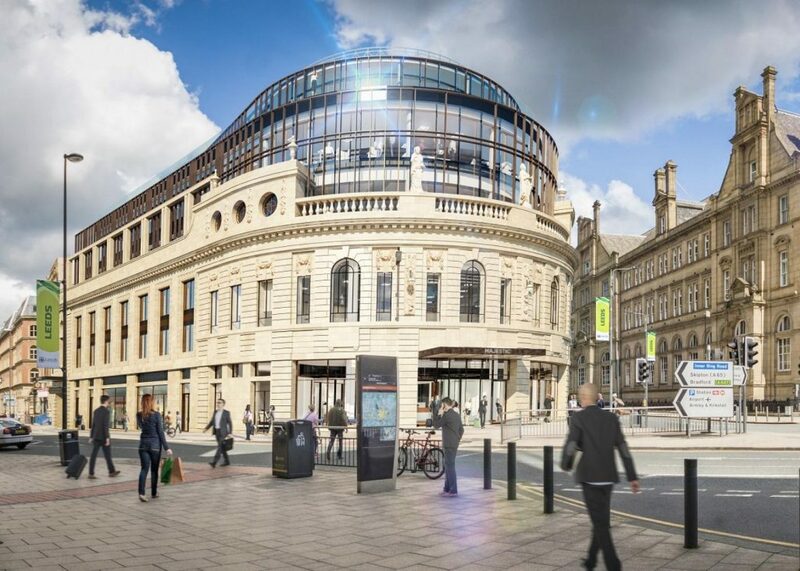 The images have been released showing how the historic Leeds city centre building will greet people as they come out of the railway station into the City’s main square, City Square. With plans for a £500 million redevelopment, and already the North’s busiest railway station, Leeds Railway Station is at the heart of the City’s economy as a hub for national, regional and local connectivity. The CGIs show how the former cinema will be transformed as the future of this historic building is re-defined to provide exemplary new office space, along with a close-up view of The Majestic’s external features. They have been released by the building’s owner Leeds-based property investment and development company Rushbond as construction work continues and the office scheme is showcased by Leeds City Region at MIPIM, the world’s leading property conference, in Cannes this week. Mark Finch, Real Estate Director at Rushbond, said: “The project team has worked hard to ensure that our plans for The Majestic deliver a sensitive restoration of the iconic building, all the while paying homage to its past while looking forward to its future. “The Majestic will provide a contemporary workplace that meets the requirements that future occupiers are looking for, while bringing the building back to life for the enjoyment of the City and its people. The 66,000 sq ft of office space will be housed behind the original external envelope of the building, which first opened as a 2,400-seat cinema back in 1922. An elegant, new three-storey atrium will create a grand majestic entrance to the building. Situated over seven levels, The Majestic will also feature terraces on the fourth and fifth floors, overlooking City Square, alongside a new domed circulatory space, re-creating the historic Palm Court, and a flexible ‘Stage’ space within the lower ground floor, as part of a comprehensive scheme to set the future of this landmark building. Councillor Judith Blake, Leader of Leeds City Council said: “I am delighted to see the vision for The Majestic revealed, showing how investment activity in Leeds continues to grow for the benefit of both businesses and local residents. Roger Marsh OBE, Chair of Leeds City Region Enterprise Partnership, added: “These new images of The Majestic look fantastic and show how this historic building is being transformed to meet the needs of Leeds City Region’s modern 21st Century occupiers. The Majestic, designed by DLA Architecture, provides the opportunity for both a single tenant to occupy the whole building or multiple occupation. Leeds is an international City at the core of the Leeds City Region, home to three million people and with an annual economic output of more than £64 billion. Photo caption: The new CGIs of The Majestic that will greet people as they leave Leeds Railway Station and enter City Square.